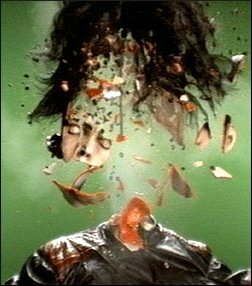 It is claimed the ExplodoMax2000™ crowd dispersal unit discriminates against young people because it emits a special frequency which makes their heads detonate instantly. Wayne Hayes, from Liberty, the pro-Iran civil liberties group, said: "Teenagers have a right to stand outside shops and express themselves with saliva. "Perhaps the shop owner should try getting to know them before he installs a machine designed specifically to make their heads explode." But Denys Hatton, from the Federation of Small Businessmen, said: "I never thought I'd see the day when it was illegal to use ultra-sonic devices to blow-up children's heads. "Some people are worried about the mess, but I'll tell you this: it's much easier to step over the bodies of a few headless teenagers than it is to push your way through a crowd." The government is now assessing a range of alternative dispersal methods including grenades, ravenous polar bears, and a special audio device which plays Fields of Gold by Sting over and over again. A Home Office spokesman said: "The Sting option is very effective at dispersing teenagers, but you then attract large groups of emotionally vulnerable, thirty-something women as well as the men who are trying to shag them. "We'll probably just go with the polar bears." MOBILE phone giant Nokia has pledged to make pocket maps obsolete with the launch of a map that fits in your pocket. What was wrong with this? Eh? Maps 2.0™, to be installed on the latest mobile handsets, will feature tiny, illegible writing and is guaranteed not to work when the battery is flat. 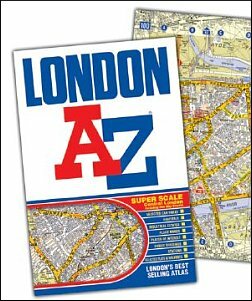 The company said the traditional printed 'A-Z', with its clear lettering, concise, booklet format and ability to function without a power source, will soon be pulped and recycled as instruction manuals for Maps 2.0™. Ari Toivonen, Nokia's head of pointlessness, said: "We want people to think of street maps as those large, awkward Ordnance Survey things that you can never fold up properly. "The sort of thing Peter Sellers would have had all kinds of problems with in a Pink Panther film." He added: "Do you want to flip open your phone and start mapping, or do you want to flail about like some incompetent French detective?" With Maps 2.0™ all you have to do is find 'Map' which can be found in 'Accessories' which can be found in 'Settings' which can found in 'Profiles'. For model numbers beginning with 'N' it can be found in 'Your Favourites' which can be found in 'Your Phone and You' which can be found in 'Functionosity'. You then simply type in the name of the street using the incredibly small keys, wait for 90 seconds and then try and work out where you are going using the incredibly small screen. Mr Toivonen said: "It works even better if you can stop a random stranger and ask if they know the post code for the exact spot where you're standing." As the screens are not waterproof, Nokia is reminding British consumers not to use the map when it is raining.